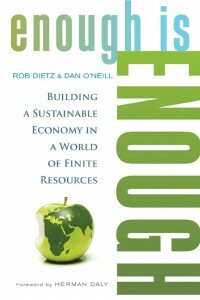 In this new book, Enough Is Enough, Rob Dietz and Dan O’Neill lay out a visionary but realistic alternative to the perpetual pursuit of economic growth—an economy where the goal is enough, not more. We’re overusing the earth’s finite resources, and yet excessive consumption is failing to improve our lives. They explore specific strategies to conserve natural resources, stabilize population, reduce inequality, fix the financial system, create jobs, and more—all with the aim of maximizing long-term well-being instead of short-term profits. Filled with fresh ideas and surprising optimism, Enough Is Enough is the primer for achieving genuine prosperity and a hopeful future for all. Good blog post. I end up taught a single thing more complex on distinctive blogs every single day. It can quite frequently be stimulating to study content as a result of other people and put on somewhat a single thing from their website. I’d preference to use some considering the content at my site whether one don’t your head. Natually I’ll offer link ınside your web web log. Thanks designed for sharing.